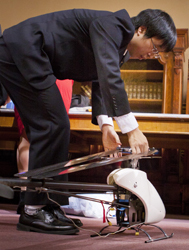 On Thursday, April 11th, a dedicated team of students and faculty demonstrated and discussed innovative “home grown” engineering prototypes at the Connecticut State Capitol during a rally in support of Governor Dannel P . Malloy’s proposed Next Generation Connecticut. Next Generation Connecticut is aimed at reenergizing and redefining Connecticut’s economy through strategic investments in science, technology, engineering, and math disciplines (STEM) at UConn. The bill, which is making its way through the legislative process, was passed overwhelmingly by the Finance, Revenue and Bonding Committee on April 16th. Among the featured speakers were Gov. 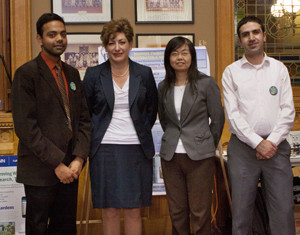 Malloy, UConn President Susan Herbst, UConn Provost Mun Y. Choi, elected officials, labor and business council leaders, as well as two outspoken executives from Connecticut businesses: Robert Friedland, co-founder, president, and CEO of Wallingford-based Proton OnSite; and Ed Murphy, Senior Director of Technology Planning and Intellectual Property at JDS Uniphase in Bloomfield. But for many attendees, the most compelling demonstration of why Connecticut should invest in UConn’s STEM programs was evidenced by the array of extraordinary projects designed and developed by UConn students and faculty members. 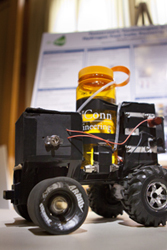 The selection of UConn Engineering projects displayed included a custom test stand for a common surgical implement, a fuel cell-powered model vehicle, unmanned autonomous aerial and land vehicles, a microbial fuel cell, and 3D manufacturing apparatus. The projects and demonstrators are summarized below. See photos here. For their senior-year design project, Biomedical Engineering students Kathryn Dobler, John Burke and Jordy Schuller designed and built a custom, prototype testing device for a Covidien product, the Premium Surgiclip™, used to clamp off blood vessels during surgery. A hand-held, stapler-like device is used to apply the clip during surgery. The medical equipment giant Covidien tasked the students to develop a fixture capable of performing several different tests to determine the force applied by the clip dispenser and its effect on the clip. The testing unit is integrated within a machine that tests for tensile, compression, fatigue, impact and hardness, with the measures displayed on an attached computer screen. The students explained that the ultimate goal of the project is to establish a clinically acceptable product specification that can be measured and evaluated. Seniors Nicholas Morse and Leia Dwyer, with their advisor, Dr. William Mustain (Chemical & Biomolecular Engineering) demonstrated “The Chegger,” a model car that runs on a hydrogen-powered fuel cell. The car was developed for an American Institute of Chemical Engineers-sponsored competition, ChemECar. Entries must rely on chemical reactions to power the motor and stop the car. The Chegger employs a light-activated electronic circuit incorporating an iodine chemical reaction to stop the car. For the ChemECar competition, vehicles must travel a fixed distance while carrying a payload, but the distance and weight requirements are not revealed to teams until competition day. Dr. Mustain and his research team are making advances in the area of electrocatalyst materials for energy conversion and storage, and in enhancing our understanding of the fundamental science behind fuel cell technology, that may contribute to the future of fuel cell applications in energy. Mechanical Engineering students Roseanna Warren, Yuqian Liu, Jiaxing Che and Robert Herman, accompanied by their advisor, Dr. Chengyu Cao, showcased prototype autopilots along with quad-copter and helicopter models – unmanned autonomous vehicles designed and constructed in the Adaptive Systems, Intelligence and Mechatronics (AIM) Lab. Dr. Cao’s lab is developing novel control algorithms to enable the vehicles to adapt to local and environmental uncertainties, such as obstacles and varying terrain. The team is also linking the vehicle control systems into networks that allow for more complex interactions among the vehicles. Other focuses include the auto-pilot technology and circuits that host the control and navigation algorithms. The team’s work will improve the robustness and adaptive capabilities of unmanned vehicle networks. Graduate students Udayarka Karra (Civil & Environmental Engineering) and Ridvan Umaz (Electrical & Computer Engineering), accompanied by Dr. Baikun Li (Civil & Environmental Engineering), demonstrated two bench-scale microbial fuel cells that generate electricity through the metabolic activity of anaerobic bacteria and the decay of organic matter found in the top layer of sediment in bodies of water. The research team anticipates these devices may provide a steady power supply for remote oceanographic devices used in sensing and monitoring ocean environments. A focus is on developing a distributed network to address the energy supply problems for underwater sensor network applications. Dr. Li and her team are exploring and testing various facets of the technology, including novel electrode materials, BMFC configurations, power management schemes, and microbial ecology analysis to enhance understanding of the various aspects related to underwater bioenergy conversion. Sonya Renfro, Program Coordinator for Diversity & Outreach, and junior Monica Smith (Mechanical Engineering and German) demonstrated 3D printing using a desktop device in which a three-dimensional object is built layer-by-layer using a plastic material. The device is one of two used by UConn’s Engineering Ambassadors in outreach visits to middle and high school students aimed at exciting the students in engineering as a fun and creative career choice. Often used for rapid-prototyping of highly complex geometries, 3D printing begins with a digital CAD design, which software interprets as a series of thin horizontal slices. The 3D printer then builds the actual shape in successive layers. Inexpensive machines are now being used to produce sculptures, machine parts, jewelry, home furnishings, and medical implants. 3D printing is related to the more complex additive manufacturing technologies underway at UConn’s recently announced Pratt & Whitney Additive Manufacturing Innovation Center, which hosts state-of-the-art Arcam electron beam devices that are suitable for manufacturing large, complex metal parts from a range of different materials at high temperature.